Since having Claire, Nick and I have found it more difficult to watch movies in which children are possessed or harmed. So, before watching The Hunger Games I asked Nick if he knew what it was about. OK. He was ready to watch it. Or, maybe not. It’s one thing to know what happens, but knowledge didn’t prevent us from being upset by what we saw. I suppose that’s true of many things. During pivotal moments, I found myself holding back tears. On film the events I read about in the book seemed all too real. At the beginning the shaky camera, while giving a realistic, gritty feel, caused a mild amount of nausea. By the time I had adjusted, the camera had steadied, and I was pulled into the characters’ storylines. Capitol with Jennifer Lawrence’s Katniss dressed as a district 12 native. The costumes, done by Judianna Makovsky, were a highlight of the movie. The citizens of the Capitol looked amazing in their over-the-top colorful garb. The grittiness of District 12 was emphasized by a wardrobe reminscent of the dirty ’30s and ’40s. The contrast between the two groups really highlighted not only the differences between them, but also emphasized the Capitol’s lack of concern and interest for the well being of the people of District 12, Panem’s poorest district. In my review of the book, I wrote that Collins often told rather than showed some of the thoughts and actions. I found the movie better in that respect. 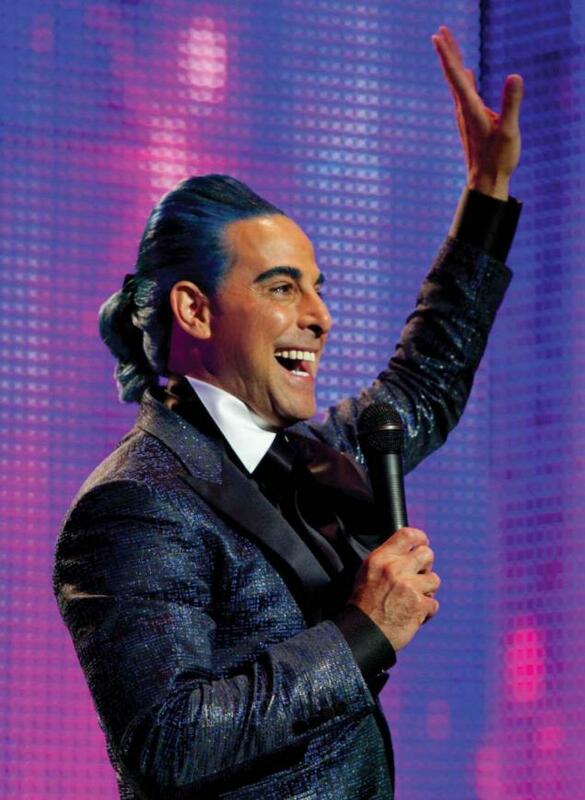 The addition of Stanley Tucci’s character as an announcer during the games fixed that. 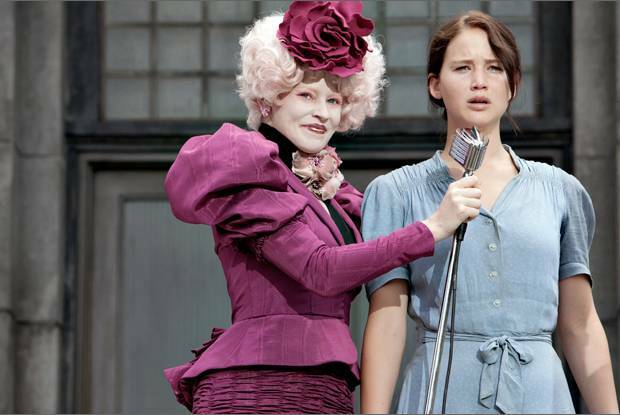 Instead of Katniss’s narration, we’re treated to Tucci’s colorful commentary. Casting was well done with known actors such as Donald Sutherland, Woody Harrelson, Elizabeth Banks and Stanley Tucci with new and less well known actors such as Jennifer Lawrence, Josh Hutcherson and Liam Hemsworth. Both Nick and I are looking forward to the second movie. According to IMDB, The Hunger Games: Catching Fire will be released in November of 2013. That gives me over a year to read and review the book before catching the movie in about December or later, because, let’s face it, I’m not waiting in a long line with teeny boppers for this movie no matter how good it is. Have you watched The Hunger Games? What did you think? This entry was posted in culture and tagged Elizabeth Banks, Jennifer Lawrence, movies, pop culture, Stanley Tucci, The Hunger Games. Bookmark the permalink.